Why Not Use The Best At Home Hair Color Kits? 4oz EcoColors Permanent Non Toxic Hair Color Kit for home coloring: $29.95 each. Everything you need to color your hair is already included in the home kit. Perfect hair color the non toxic way! Apply EcoColors Non Toxic at Home Hair Colors to cover grey hair, add highlights or simply enhance your natural hair color with shine, luster and extra body. EcoColors' gentle non toxic hair dyes are super-conditioning and nourishing permanent hair colorant. They have been enriched with natural and organic ingredients such as flax, castor and jojoba oils as well as flower essences, silk, vitamin E / C and natural preservatives. The added silk strengthens the integrity of the hair and prevents hair loss from breakage. 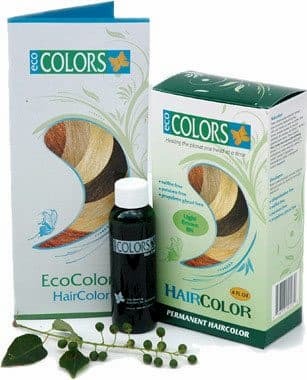 EcoColors home hair colors kits contain no sulfites, paraben, propylene glycol, ethanolamine, MEA or formaldehyde residues. EcoColors nontoxic hair dyes are ppd free (which is a common allergen in hair dyes and is also cancer causing) and also gluten free for people suffering from celiac and sensitive scalp. Most people who are allergic to other hair colors do not react to EcoColors Hair Color. Our gentle hair color is for men and women with all hair types. To this day, EcoColors Hair Color consistently surpasses it's competitors in performance and quality with super conditioning salon grey coverage that is natural looking and shiny. After coloring, apply EcoColors Organics Lavender Shampoo & Conditioner for best hair colouring results. Black hair color 2N is formulated for grey coverage. Application will result in a dark brown shade. To get a darker shade of black mix with Dark Ash Brown. Dark Brown 5N is formulated for grey coverage . Application will result in a medium brown shade on hair that has more than 60% grey. Use Dark Ash Brown if you do not want to see underlying red tones and a darker shade of brown. Medium Brown 6N is formulated for grey coverage. Application on grey hair will result in a medium to light brown shade. If you want to counter red tones, try Ecocolors Medium Ash Brown instead. Dark Ash Brown 4C is formulated for grey hair coverage. Application will result in a natural dark brown shade. Dark Ash Brown is used to counter unwanted red tones in existing dark brown hair. Medium Ash Brown 5C is formulated for grey coverage and to counteract unwanted red tones and color grey hair a medium brown tone. Medium Ash Brown is a neutral medium brown. Reddish Brown 8OR will result in a reddish violet shade on grey hair. To make this shade look more natural please mix it with EcoColors Golden Blonde. Reddish Brown is a copper brown, and looks great when you mix it with Golden Blonde 8G. This combination on grey hair gives an auburn tone. You can also mix Reddish Brown with Dark Brown to give it a deeper look. Golden Blonde 8G is formulated for grey coverage. Application will result in a light blonde golden shade on grey hair. If you want to make a less golden blonde on greys, try mixing with Medium Ash Blonde or Neutral Blonde. Bright Red 6RV is formulated for grey coverage. Application will result in a bright red shade. Bright Red can be applied to brighten brown hair to a warm tone. Light Auburn 8RO is formulated for grey coverage. Application to a majority of greys will result in an orange unnatural shade. We recommend you mix this color with equal parts Golden Blonde 8G if you have more than 25% grey. The light auburn hair color alone looks great by itself on brown hair with no grey. Warm Auburn 6RO will result in a red shade on greys. Use Warm Auburn if you want to see underlying red tones. Mix Warm Auburn hair color with Medium Brown or Dark Brown to achieve a natural red shade on grey hair. Mix Warm Auburn with Golden Blonde 8G to achieve a nice auburn color on grey hair. Warm Auburn is a red with slight cool tones. Medium Ash Blonde 8C is a level 8 and will counteract orange or red tones. If you have more than 25% grey, you might want to mix Medium Ash Blonde and Light Brown in order for the greys to look natural. Light Ash Blonde 9C is formulated for grey coverage . Application will result in the light Ash Blonde shade on grey or blonde hair. Light Ash Blonde is the lightest shade in the Home Kit line. Neutral Blonde 8B is formulated for grey coverage. Application will result in a a true beige or wheat colored blonde. Mix with EcoColors Golden Blonde to achieve a more natural looking blonde. Dark Blonde 8V is formulated for grey coverage. Application will result in a Light Blonde shade on grey hair. On other shades of hair you must do a test strand to determine the end shade result. Dark Blonde is a cool blonde. If you are unsure of what color to use, please click here so that we can assist you with your personalized formulation. A professional hair colorist will help you choose the best hair color for your type of hair. For normal to dry or treated hair. Gently cleans and nourishes while adding body and shine. Rich with proteins, vitamins and minerals. A and E are added to help soothe and protect the scalp. Cruelty free. No synthetic colors, fragrances or fillers. Made with organic ingredients. Gluten free. Recycled container. Available in 4oz travel size. Detangles hair and mends split ends. Anti-static complex helps reduce frizz and controls the hair. Amino acids and Vitamins A & E are added to soothe and protect the scalp and promote healthy hair growth. Cruelty free. No synthetic colors, fragrances or fillers. Made with organic ingredients. Gluten free. Recycled container. Available in 4oz travel size. then click the "Check Out" button to begin check out. - 2 oz EcoColors Hair Color. - 2 oz EcoColors Developer Gel Activator in 4oz applicator bottle. - Easy to follow step by step directions. Buy up to 8 items and just pay $14.35 flat rate for shipping anywhere in the USA! If you are unsure of what color to use, please click here so that we can assist you in finding your personalized formulation. A professional hair colorist will help you get the best hair color for your type of hair. Avoid using Light Auburn alone on gray hair, it is best to mix it with another color. assist you in finding your personalized formulation.